FOR IMMEDIATE RELEASE: Bangor, Maine (December 10, 2018) – It has been a meteoric rise through the New England Fights enterprise for Zac Richard, who will celebrate one year since he started training in the sport by fighting for the featherweight title on February 1st. 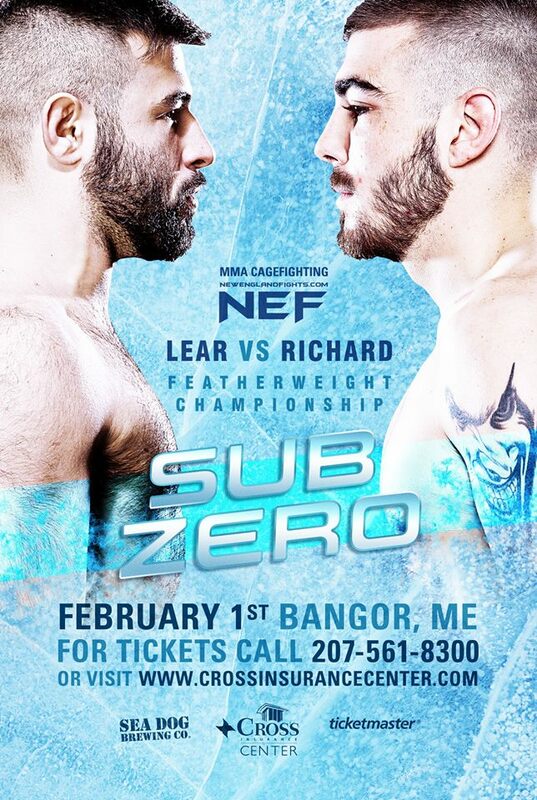 Richard, a state champion high school wrestler with three first-round stoppages to his credit since he transitioned from the mat to mixed martial arts, will face former bantamweight champion Fred Lear for the vacant 145-pound strap at NEF 37: “Sub Zero.” The fight will be held at Cross Insurance Center in Bangor. In a recent interview with Ryan Jarrell and Bryan Stackpole for the Between Rounds Radio podcast, Richard noted that MMA has given him balance and structure after a tumultuous time in his personal and family life. Richard’s last fight, a 51-second stoppage of Chris Lachcik by rear naked choke, took place one day before the six-year anniversary of his sister Lacy’s death from cancer. “Every year around this time, I always found myself making bad decisions or being down in the dumps. This year I had something to take my anger out and have all those people come out and support, so it was pretty awesome. It’s the best mindset I’ve ever been in for a fight, that’s for sure,” Richard said. NEF co-owner and matchmaker Matt Peterson knew he had a fighter on his hands the moment Richard signed with the organization. Anyone who thinks the opportunity is being extended too soon probably isn’t familiar with the fighter, his background or his disposition. A graduate of Massabesic High School in Waterboro, Richard said he started training in 2018 as part of a new year’s resolution. That journey took him an hour away to Nostos MMA in Somersworth, New Hampshire, where his dogged determination and raw talent caught the eye of none other than Devin Powell, the former NEF Lightweight Champion and current UFC (Ultimate Fighting Championship) competitor. Richard said friends and family, at first, didn’t believe him when he told them of the connection to the local celebrity turned worldwide fighter. Richard recently relocated by renting an apartment across the street from the gym, providing further evidence of his commitment. Working with Powell has its privileges, but it also comes with a lighter side. Richard elicited a few laughs on the program when he relayed the story of his mentor adopting a baby pig. It’s a free-range animal, he reported, wandering the gym right along with Powell’s fighters. Richard and Lear will meet in the middle in terms of weight for their title bout. Lear, out of Young’s MMA in Bangor hasn’t fought since his victory over Walt Shea for the 135-pound title in August 2017. Richard will come down in weight after tackling his past two outings at 155, not far below his typical walking-around weight of 160 to 165. It will be a challenge in the cold Maine winter. Richard, who is a mechanic by trade, said his job helps him sweat out the pounds during summer. That shared wrestling background made the fight with Lear (6-2) attractive to Richard. In addition to being on enemy territory in Lear’s hometown, Richard expects to be seen as the underdog due to the opponent’s previous title fight experience. Richard said he has never been much for watching film of opponents, knowing that tactics can turn on a dime. He has watched two of the bouts in Lear’s archive, though, and both expects and craves a battle for the ages. Lear’s year-and-a-half of inactivity is in stark contrast to Richard’s rapid-fire approach since gravitating to the sport. The newcomer hopes that won’t be held against him if he comes out on top.